Will all this action come to Wii U? The seemingly never-ending Dragon Quest X saga continues to roll on. Despite having been announced several years ago, Square Enix is yet to show off the tiniest fragment of its Wii RPG, though the company still promises it will see release on Nintendo's current white box. Could it also see the light of day on its next one, though? During a shareholder meeting, Square Enix CEO Yoichi Wada was asked whether the project would continue on Wii now the machine's apex is behind it. Wada replied that the company would consider making the game compatible with Wii and Wii U, and technical investigations are currently underway. If the game were to launch on both formats, which one would you pick up and why? OMG DQX NEWSSS!!!!! i was fearing vaporwear! Dragon Quest IX was on DS and it was amazing. I say make this a 3DS exclusive, throw in all the cool quests and treasure maps, and let it win Best of E3 like DQIX did. Depends on whether or not the version's have more to offer than a graphics overhaul, provided they actually do make two versions, of course. So, from what I understand, they now check if it's possible to make DQX a disc for Wii that possibly has enhanced additional features such as HD graphics and tablet controls when you run it on the Wii U. Just like those DS games that have DSi features when you run them in the DSi. From a business standpoint.... Since it is DQX which is a system seller in many regions of the world, I would try to make it Wii U exclusive, but a Wii disc with Wii U features is ok I suppose. One thing we can all agree on: One version is enough. "Wada responded that Square Enix must consider making the game compatible with both the Wii and its successor, the Wii U." ...sounds to me as if they'd look into something like a "WiiU enhanced" game. Don't know if it's technically possible, but the thought that the game could run on the Wii and with the same disc on the WiiU (+ graphical enhancements) is cool. Just having the game rendered in 1080p + AA on the WiiU would be fine. It does wonders for other stylized games, like Mario Galaxy (only 720p screens). @SKTTR From a business perspective, you would not make it WiiU exclusive. When DQX is released, it's likely that there won't be a significant enough install base. From a business perspective you go for the largest install base you can find. In that sense, having a game that runs on the Wii and still has advantages when played on the WiiU means you can cash in on Wii owners while WiiU owners get a bit of extra incentive. Sounds like a plan. anyway, something like oracle of ages/seasons? where it had the shop that was only present if played on gba? I'm just excited that they are releasing it for a home console, just as it should be. Don't get me wrong, I loved DQIX, but I only put in 1/4th the time I would have into the game if it was on a screen that actually allowed me to relax. I think that they'll make a dual release. While TP had it's issues, it also sold. They want to make sure they have as large a market as possible for the game, and I don't seem them doing this any other way. For the WiiU to be able to automatically upscale a Wii game, there would have to be software dedicated to each title already stored on the WiiU. So, no. The only thing I see them doing to re-releasing some of the more popular titles IF they think it'll make some easy cash. Here's the thing about Dragon Quest; They could release X on the original Game Boy and the game would STILL sell like gangbusters. I'm confident that even if this game comes out two years from now (which is historically a likely projection) on Wii, it's not going to matter that the system has already been replaced. The Dragon Quest brand is that strong in Japan. However, having the game run in HD when played on Wii U might not be a bad idea either, although I wouldn't expect exclusive features to go much beyond that, save for using the controller screen for item management or something. Graphically though, it would just be a resolution increase. BOTH BOTH BOTH BOTH BOTH!!!!! Well lets see - When is the WiiU coming out? Nobody knows. When is DQX coming out? Nobody knows. Hard to make a rationale decision with so little information. That said, plenty of titles get dual releases - games still come out on the PS2 (of course they are more PSP than PS3 ports, but they do release) and a few games have even released on both the HD systems and SD Wii, so why limit themselves? How hard can it be to move the inventory screen to the Upad display and tell everybody it's a WiiU game? Depending on it's release date it might sell more on the WiiU than the Wii as the Wii doesn't sell thru third party games well and WiiU owners will buy whatever comes out for awhile, that's how crappy launch titles sell well - so few choices. SquareEnix would probably also like to know the WiiU price (wouldn't we all) - cheaper WiiU equals larger base. Square Enix could make that as Nintendo made for Zelda : Twilight Princess. They already announced it for Wii a while back, but Wii U? I'm in! Again! Iwonder how much Wii U games will cost as I would love to get the Wii U version if it does indeed come to light. But I'll probably just end up getting the Wii version because of cost. And because I don't even know when I'll b gtting a Wii U-If I will get one. I'm very happy they're making it for wii/wiiU? and the fact they're making it similar to DQ8. I found that game far better then the Disappointing DQ9. can't we have it on the 3ds? dq is all about late console lifetime releases. Look at......well, DQ4, DQ6, DQ7, DQ8, and DQ9 if you need examples. I'm just glad that it is still being made. I was starting to worry that it got cancelled. I think that they should focus on bringing this game to the Wii U. Not only would the game benefit from better graphics but the Wii U controller could be used in very interesting ways like managing your inventory. Plus, releasing a new Dragon Quest game on a new console would sell tons of copies not to mention systems in Japan. 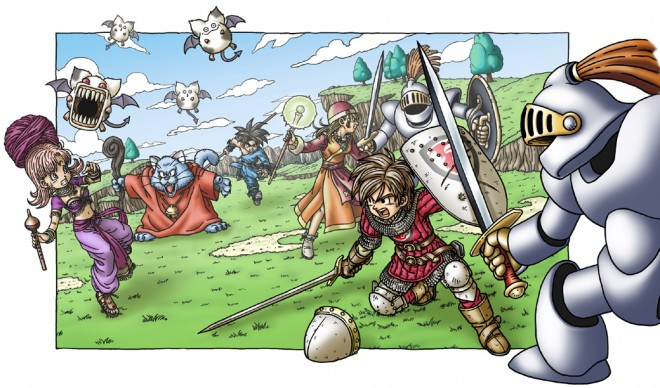 Hopefully Dragon Quest 9 has convinced enough people in other parts of the world that this series is a worthy investment. Honestly, this game is all the convincing I need to justify owning a Wii U. @silverfang Where did you heard that it will be similar to DQ 8? @GuardianAcorn Thanks, the link is fixed. considering how late a DQ game comes out in a console's life cycle I think this is a good thing that it will have Wii U support as well. I would definitely prefer Wii U. DQ8 looked great, so I'd like to see 10 touched up for HD, and more buttons + touch screen should be useful. I'd be all over this as a Wii U title and think it would be the smarter move. Sure they could put it on a Wii disc and have Wii U improvements such as using the touch pad controller to work as a menu/map combo as it did on the 9th game for DS. But as a Wii U game, knowing the rabid DQ base in japan that makes FF look small, I'd think it would be a no brainer help for both Nintendo and them. They could get millions of systems sold just to buy the game and then Nintendo could back it up further with their own games insuring people hold onto it for the long term. Make it a launch title and watch systems fly, then just don't price cut it for a year or two and rake in the profit over a period of time. ^Thank you very much for clarifying that. Personally, I'd like for it to stay on the Wii.